My cat, "Kitty Kitty Meow Meow", passed away in September. She always loved to lay under the Christmas tree and "help" me wrap presents. I think the holidays were her favorite time of year! It seems as though she's thinking about something in this picture... How would you caption her? What do you think she has up her sleeve? 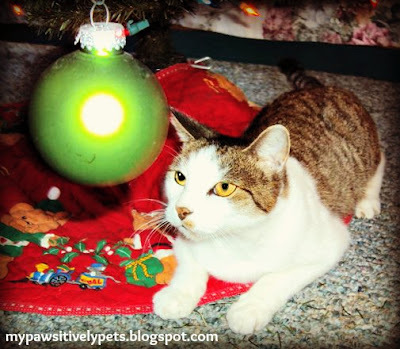 "How long is she going to hang around with that flashy thing before I can attack that ornament?!" :-D I'm sorry that you lost your buddy, she was very beautiful! It does kind of look like that. Good idea Sugar! Thank you kitties and mama! "Now that I know you're there, I'll be playing with you at 3am!" Maybe lol... she never did seem too destructive with the ornaments... the packages were different though. I am sorry she is gone, but she was a beautiful kitty. Sorry to read she has gone but have a wonderful Wednesday. Sorry for your loss...what a coincidence that we both shared pictures of out late pets. Who's that cat in mum's Christmas ball? She looks like she was a real sweetie. Could she be thinking..."Get behind me Temptation!" I'm going to get that glass ball! Such a beautiful kitty. So sorry to hear that she won't be with you this year. Thank you Carma, it's ok though. It was her time to go. I know you'll miss KKMM this holiday season! She was precious! Happy holidays! I am so terribly sorry for your loss (((((hugs)))) I think she would be saying "I hope Santa brings me an extra special treat!" Thanks Caren, I'm sure she might think something along those lines. Let me at it…I'll kill it for you! She was a good "killer". She liked to hunt rabbits in the yard unfortunately... Thank you for visiting Janet! I'm so sorry to learn that Kitty Kitty Meow Meow crossed *OTRB* this September. Hope you lots of beautiful memories in a pocket on your heart. She's future gazing in her crystal ball! She's saying, "I can climb to the top of this tree in 5 seconds flat, with one paw tied behind my back!" We are so sorry to hear about your sweet Kitty and are sending our deepsest love and comfort to you. "Are you kidding me? Of course I can nom you!" I bet Kitty Kitty Meow Meow is with you in spirit, especially this time of the year. I am sorry that Kitty Kitty Meow Meow is not with you for these holidays :( I bet she is having some really great holiday fun across the bridge! Thanks Remy. She's probably out there laying on wrapping paper and swatting ribbons around. Sorry for you loss, she looks like she's going to pounce on that bauble any second...!